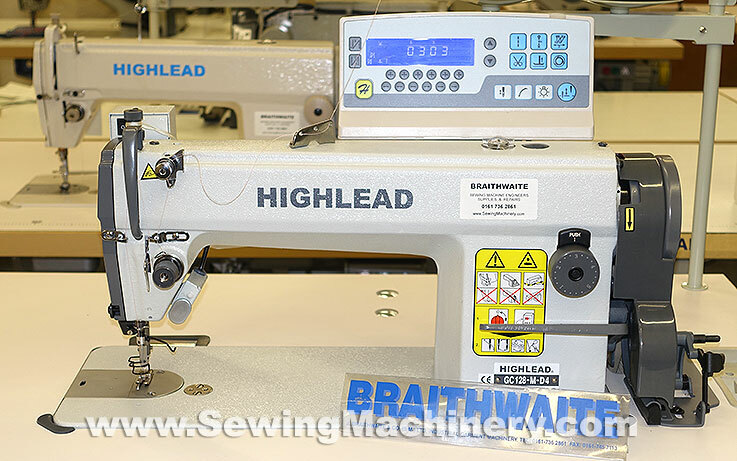 The Highlead GC128-M-D4 is a single needle lockstitch industrial sewing machine, with thread trimmer, for use on a wide range of light to medium weight fabrics. The position of the needle is controlled by an energy saving electronic needle position motor & controller. This will automatically put the needle in an UP or DOWN position at the end of a sewing cycle: reducing the need to use the manual hand wheel. Different stitch count functions are available and operated via the included touch button control panel with clear blue digital display. For example: an operator can set a number of stitches (up to 99) and the machine will stop automatically when the set amount has been sewn. 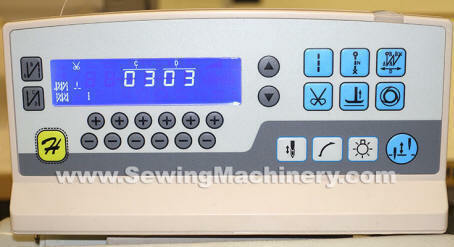 Programmable automatic back-tack stitching reduces the need to use the manual reverse lever. 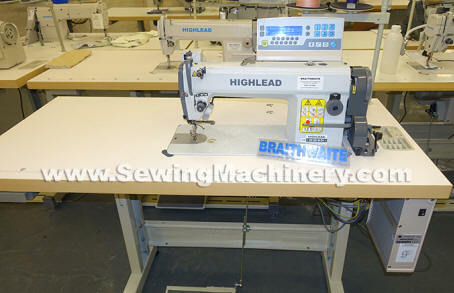 This Highlead GC128-M-D4 industrial sewing machine has been refined over many years of use in clothing & textiles factories; it is a high speed, smooth, well balanced & robust sewing machine. As well as the automatic thread trimmer and electronic functions, it still has the standard features which users are familiar with, e.g. manual reverse lever, stitch adjusting dial, bobbin winder, hand or knee operated foot lifter etc. Energy efficiency is built-in with the inclusion of Highlead's latest energy saving electronic servo motor; which only turns when you are actually stitching. In operation its smooth + quiet and in standby its silent and little energy is wasted. The Highlead GC128-MD is one of our longest serving models, which has been on sale for approximately 20 years. It was originally manufactured as part of the technical agreement between Highlead & Mitsubishi, with variants sold under both brand names. Mechanically, little has changed in the past 20 years and it still features the excellent Mitsubishi designed thread trimmer system and long life over-sized solenoid devices. Electronically the model has been revised to keep it up to date with the latest standards and features. We understand more recent & competing designs (including Highlead's own) are less expensive to manufacture, however Highlead still makes this classic model because of its proven robustness and continuing demand from high volume factory users.